Jess gets crafty: We have a winner! Firstly - thank you to everyone who entered my little felty giveaway, it's always lovely to hear from you all! Secondly - hello to my 3 new followers! It's fantastic to have some extra people following and I hope you enjoy reading my little crafty blog. 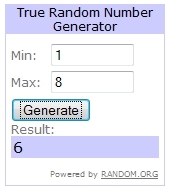 The Random Number generator gave me the following result so the lucky winner this time is TheBigMango, congratulations! I'll be sending you an email shortly to let you know you've won and once you've gotten back to me with which doughnut/cupcake you want it will be in the post to you pronto! Sorry to all those who didn't win this time - hopefully I'll be up to 100 followers before too long and will be hosting another giveaway then. Too bad for us but congrats to he winner!! Hi Jess, The doughnut keyring arrived yesterday. It's so cute. Thanks very much. Glad it arrived okay - it was hand posted by little Sam so may have had a few of his fingerprints on the packaging!